Ven. Dr. Cheongryang Chong'An Dharma (Thích Đức Thông) is an Archbishop and Monk in the Five Mountain Zen Order. He was consecrated a Bishop in receiving inka during Sangha Weekend in 2012, and consecrated an Archbishop during Sangha Weekend in 2017. He holds Precepts in the Vietnamese Lam Te Thíen tradition and in the Korean Imji tradition. Chong'An has involved himself in the study of Buddhism and Eastern Wisdom traditions over the past 19 year. 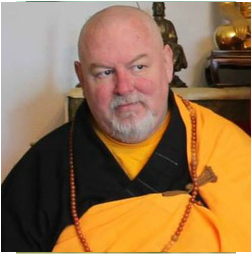 He has traveled to a variety of training centers and monastic institutes around the United States and overseas, all of varying lineages and traditions. He received the ordination name of Chong'An (meaning "clear vision") under the authority Ven. Dr. Wonji Dharma in the Five Mountain Zen Order, following the Korean Zen tradition of Zen Master Seung Sahn. Chong'An also took precepts in the Vietnamese tradition receiving the name Thích Đức Thông with the late Ven. Suhita Dharma (Thích An Đức), a student and Senior Dharma heir of the late Thích Thien An. Chong'An is committed to preserving the teachings of these traditions through translation and application of those traditions into the daily lives of American Buddhists. Chong'An is also a licensed psychologist in the state of Ohio. He is the Director of Psychology at OhioGuidestone, a non-profit mental health organization in Ohio, and runs a small private practice in Cleveland, Ohio (Robert B. Denton, Psy.D. LLC). He attended Case Western Reserve University, receiving his Bachelor's degree (B.A.) in Psychology. He received a master’s degree in Clinical and Counseling Psychology (M.A.) from Cleveland State University, and his doctorate in Clinical Psychology (Psy.D.) from the School of Professional Psychology at Wright State University in Dayton, Ohio. Additionally, Chong'An also received a Doctorate (Ph.D.) in Buddhist Studies from Buddha Dharma University. He is the lead author of the chapter “Clinical Uses of Mindfulness” in Innovations in Clinical Practice (with Dr. Richard Sears) and third author of the book "Mindfulness in Clinical Practice" (with Dr. Sears and Dr. Dennis Tirsch) available through Professional Resource Press. 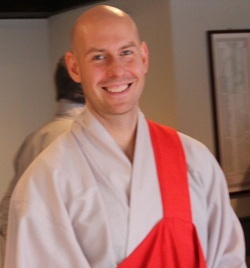 Outside of his studies in Psychology and Buddhism, he is a Nidan (2nd degree) Black Belt in To-Shin Do Ninjutsu, and a Shodan (1st Degree) Black Belt in Bujinkan Budo Taijutsu, and taught a small training group in Cleveland Heights, Ohio. He is also an at-home (his own) chef who enjoys the exploration of world culture though culinary flavors and technique. Zen Master Ji Bong, in the Golden Wind Zen Order in April, 2006. 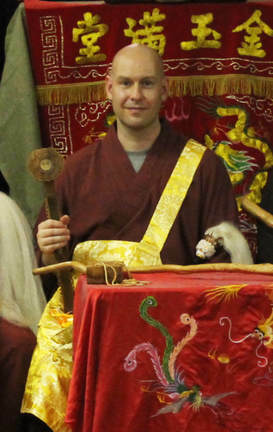 Wonji additionally received the 250 Bhikṣu vows on November 1, 2012 with Bhante Suhita Dharma (Hòa Thượng Thích Ân Đức), who was the first Dharma Heir of the Hòa Thượng Dr. Thiên Ân. Unfortunately Bhante died suddenly on Dec. 28, 2013 in Los Angeles at Chùa Diệu Pháp Temple in San Gabriel, California, where he resided. He was 73. Following the agreement made with Bhante Suhita Dharma to study for at least five years under a Thien Master, on July 15, 2014, Wonji was accepted as a student of Ven. Thích Ân Giáo Roshi who was Bhante Suhita's Dharma Brother and close friend. Knolls area of Long Beach where it remained until the center was forced to close and relocate to a non-residential Center in 2000 due to zoning Issues with the City of Long Beach. Temple) which is located in Kansas City, Missouri.